Unmoved by pleas that ruling against Argentina on how it manages its overseas debt will upset the entire global process of government borrowing, the Supreme Court on Monday firmly rejected any legal relief for that country against creditors to whom it owes billions. In a seven-to-one decision (with one Justice not taking part), the Court ruled that investors who bought bonds that went into default and never drew any pay from Argentina can get access to a potentially wide array of bank records to locate financial assets overseas that those investors might be able to seize as compensation. And, without comment, the Court cleared the way for those same investors to demand payment on the bonds they hold whenever Argentina makes any payments to holders of later bond issues which that country has continued to honor. At this point, it is not clear when that opportunity would actually occur, as a practical matter, because Argentina has some legal maneuvers still available and there has been some talk of a potential settlement deal. After weeks of anticipation about how the Court would deal with the long-running legal fight over Argentina’s debts to foreign investors, the Justices took what well may be decisive action on both that government’s obligations to those investors and the options open to those investors to find out where Argentina keeps its money, around the globe — an initial step toward going after some of those assets. The most immediate effect of the Court’s two responses appeared to be that Argentina’s ability to raise new money to finance government operations could be significantly impaired in U.S. money markets, and probably in such markets elsewhere in the world. The U.S. government had given Argentina a good deal of support as this legal fight went on, precisely because U.S. officials feared that government debt restructuring around the globe could be disrupted if Argentina lost. Although lower U.S. courts had expressed confidence that Argentina now has the financial assets to meet its obligations to all of the holders of its overseas debt, there was at least a possibility that Argentina might be forced into a new round of default — something that has happened to it repeatedly at various times over the last century. There have also been indications that Argentina would make a new attempt to refinance its debt, but would try to do so outside the U.S., to get out of the reach of U.S. courts. For now, however, the Supreme Court, having acted on both disputes before it, is now likely to move to the sidelines, as the legal scene shifts back to the U.S. Court of Appeals for the Second Circuit and a federal judge, U.S. District Judge Thomas P. Griesa, in New York City — the two courts most centrally involved with the South American nation’s financial troubles. Argentina does have the option of asking the Supreme Court to reconsider, but such pleas almost never succeed. Such a request by Argentina, however, would not prevent the Supreme Court’s denial of review of its payment obligations toward holders of its defaulted bonds. Clearly the most significant action by the Justices was that denial of review, because it made final and binding rulings by the lower courts that Argentina was required by its own promises to provide equal treatment to holders of its defaulted bonds and holders of new issues of bonds it later sold to investors who were willing to swap defaulted bonds. Argentina, those lower courts had held, had made those promises as part of its effort to induce international investors to take a chance on a country with a long record of defaulting on its debts. The key promise, those courts found, was that it would treat holders of the defaulted issues equally in repayment with holders of the later issues. Not a single payment could be made to the later investors without triggering an obligation to pay off the earlier ones, according to those rulings. Besides refusing to hear Argentina’s plea that U.S. courts had no authority to command how it, as a sovereign nation, deals with holders of its external debt, the Court silently turned aside a plea by Argentina to get an interpretation by New York state courts of just what legal obligations of equal treatment Argentina has undertaken in selling the now-defaulted bonds. In contrast to the simple denial of those issues, the Court issued a full-dress opinion on the separate question of how wide an opportunity the holders of defaulted bonds would have to gather information from two banks about the location of Argentina’s financial assets overseas. 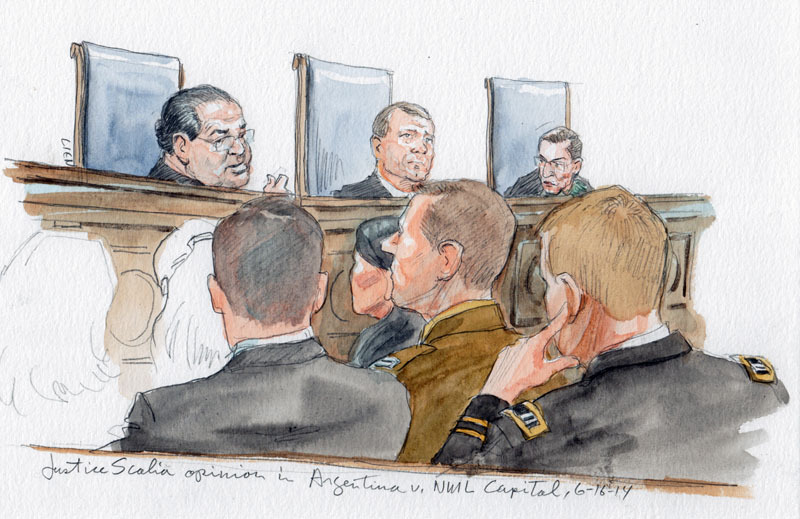 In an opinion by Justice Antonin Scalia, the Court rejected Argentina’s argument that those bondholders could only seek information about assets that that country keeps in the United States. Argentina had relied upon a 1976 U.S. law seeking to insulate foreign governments from some legal obligations in U.S. courts. For one thing, Justice Scalia noted, Argentina had given up its immunity to demands for information about its assets that could be used to cover its obligations on debts. But, in addition, Scalia wrote, the 1976 law on foreign immunity simply says nothing at all about giving foreign governments immunity to demands that they produce information that may be necessary to satisfy a debt obligation they had undertaken. The Scalia opinion had the support of six other Justices. Justice Ruth Bader Ginsburg filed a brief dissent, and Justice Sonia Sotomayor took no part. Sotomayor appeared to have taken herself out of the case because she had had something to do with the Argentina debt litigation when she was a judge on the Second Circuit.